In removing my trans, I discovered soemthingt hat seems odd to me, and I'd like to hear from y'all who know. The trans mounts are held into their carrier (and the chassis) with 2 bolts each, held by a nut on the bottom. I don't have them in my hand, but they're probably an M10 thread. Oddly, they fit snugly into the holes in the mount, but the holes on the carrier attached to the chassis that the bolts drop into are substantially larger. This means that it's quite possible (probable?) that they move around in that hole. Is this correct? should there be a bushing of some sort? do I have a mismatch of something? Oh you again? Are you talking about the 2 bolts that pass thru the rubber insert? If so I don't recall any loose fit to that degree. I upgraded mine to the 987 style with the new isolators and everything fit precisely, there was no room for movement there. OR you're talking about where the mount attaches to the sub frame? If this is the case (and I think it is) then this is a loose fit although it is tighter than where the four studs pass through the sub frame, lots of movement there. Last edited by 911monty; 08-10-2018 at 09:27 AM. 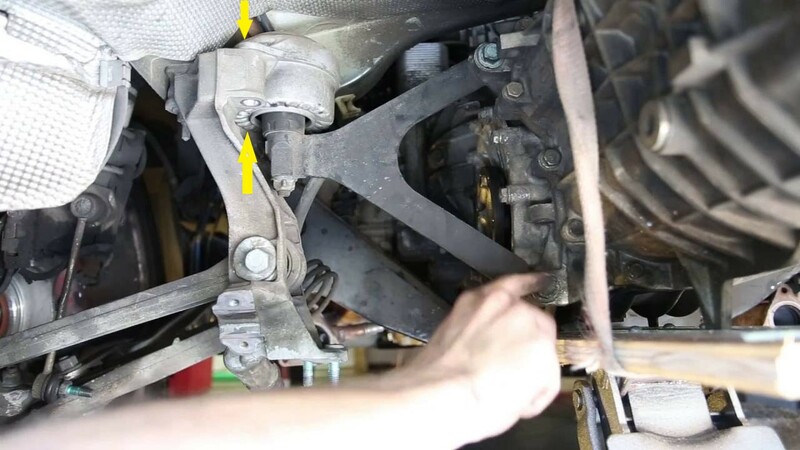 If i did this right, then I just attached an image I took from Google, and added yellow arrows to show the location of the bolt I'm describing. Fingers crossed that I did this right, haha! Anybody? Anyone know WHY there's this mismatch in the hardware? It one of the mysteries of German engineering!